Day 12: An Unexpected Detour – The San Francisco Bay Trail: It's Closer Than You Think! POST TREK UPDATE: Thanks to artist Tom Schultz, I now know much more about the creator of the above sculpture. His name is Osha Neumann and he is a gifted artist, activist, author and local civil rights attorney who represents the homeless. More information about Osha can be found in this article on the Art Practical website. I passed them twice – once along the Bay Trail looping around Point Isabel and again on the Bay Trail next to the I-80 frontage road. Then, as I stopped to shoot what would be one of my one hundred and forty three throw away images today, they caught me again. We exchanged hellos and then she asked, “Are you Kurt?” And that is how I met Karen and Leah. Karen asked me if I was going out to the Albany Bulb. “Why, uh, yes?” Actually I hadn’t planned on heading out there as I was hoping to make up some time between Point Isabel and Emeryville with a couple of detours into the Berkeley Marina and Cesar Chavez Park. The Albany Bulb is not yet a formal extension of the Bay Trail, but now that I had a couple of guides to lead the way, how could I resist? As Karen explained what I was in for, I became more and more intrigued and “making time” was no longer a priority – in fact, today would turn out to be my second longest trek. I am a curious guy by nature – I see an offshoot of the trail and can’t resist what surprises may lay ahead. After all, what is another one or two miles, right? However, do that three times and add it to the eight miles you actually had planned and you almost double your miles for the day. Karen talked of castles, found art, a little about the homeless encampments and then more about the art. She led the way and I blindly followed. 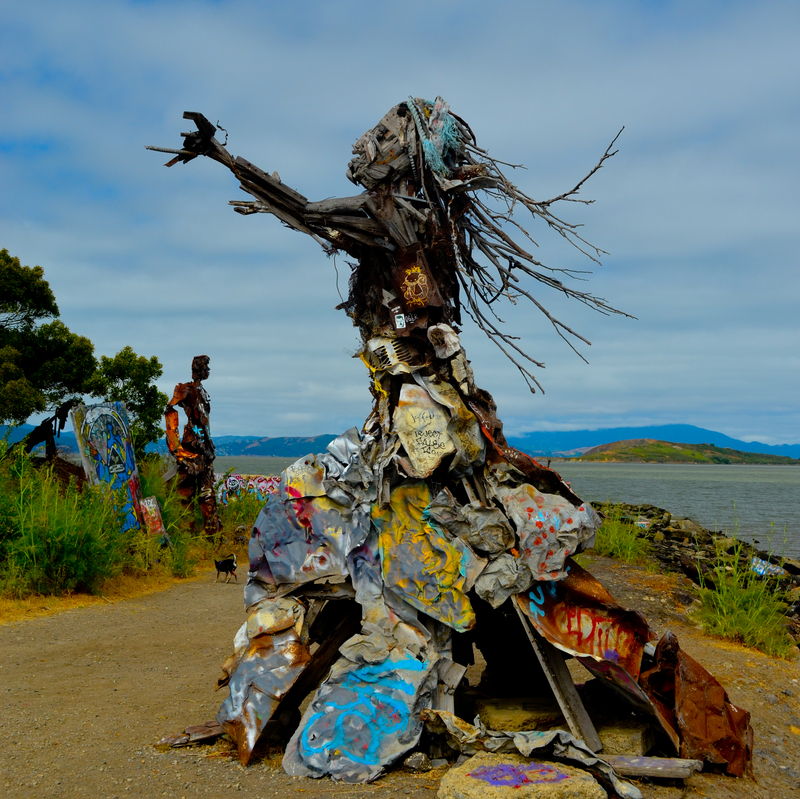 The Albany Bulb is a peninsula off the north end of Golden Gate Fields. The Albany Bulb and Golden Gate fields together resemble Daffy Duck, with the Albany Bulb being his head and a narrow isthmus, his neck. While pondering the Bulb from Point Isabel earlier in the morning, I noticed some tents and what appeared to be more permanent encampments, one with an Irish, American and POW flag hanging proudly next to a shanty. I was hesitant to disturb someone’s precarious claim to the land, however with the guidance of Karen and Leah I trudged ahead. As we approached Daffy’s beak the art began to appear, first as a graffitied tree then as oversized intricate wood, steel and plastic human figures in various poses, some sitting side by side on a fallen tree while pondering their surroundings, others riding dragons or standing among the rocks. As I came to the end of Daffy’s beak, I was particularly moved by what I saw as a Native American woman who could be dancing, in the midst of an animated conversation or mourning a loss. In either case, she moved me. I wanted to understand what she was trying to say. I wanted to know who created her so I could ask. Her image was both haunting and beautiful. We moved on along the shoreline climbing over discarded blocks of loose concrete and a mine field of rebar twisting and protruding every which way. I wondered out loud when I had my last tetanus shot. Had I missed the Albany Bulb today I would have missed what was quite possibly one of the hi-lights of my entire walk thus far. I owe a huge thank you to Karen and Leah for tracking me down and sharing a hidden treasure of their community. I can only hope that this happens again and again as I continue down my path on the Bay Trail. I love surprises so come on out and find me sometime!